Salla is a municipality of Finland, located in Lapland. 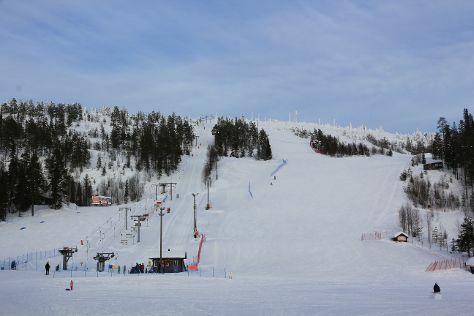 Kick off your visit on the 18th (Mon): stroll through Salla Ski Resort, learn about all things military at Salla Museum of War & Reconstruction, and then contemplate the long history of Paikanselan Taistelualue. To see other places to visit, where to stay, more things to do, and more tourist information, use the Salla trip itinerary site . Tel Aviv, Israel to Salla is an approximately 14.5-hour flight. In March, Salla is cooler than Tel Aviv - with highs of -1°C and lows of -13°C. Finish your sightseeing early on the 18th (Mon) to allow enough time to travel to Inari. On the 19th (Tue), relax in the rural setting at Reindeer Farm Petri Mattus, examine the collection at Siida, and then pause for some serene contemplation at Pielpajarvi Wilderness Church. For reviews, where to stay, other places to visit, and more tourist information, refer to the Inari online route planner . Traveling by car from Salla to Inari takes 4.5 hours. Expect a daytime high around -1°C in March, and nighttime lows around -12°C. Wrap up your sightseeing on the 19th (Tue) early enough to drive to Akaslompolo. On the 20th (Wed), see exotic creatures in open habitats at a safari tour and then head outdoors with Seven Fells Up. To find photos, more things to do, reviews, and more tourist information, use the Akaslompolo day trip planning app . Getting from Inari to Akaslompolo by car takes about 4 hours. Other options: take a bus. In March, plan for daily highs up to 0°C, and evening lows to -10°C. Finish your sightseeing early on the 20th (Wed) to allow enough time to drive to Rovaniemi. Kick off your visit on the 21st (Thu): get engrossed in the history at Arktikum, explore the different monuments and memorials at German Soldier s Cemetery, then see Santa Claus Office, and finally see exotic creatures in open habitats at a safari tour. To see where to stay, ratings, and tourist information, refer to the Rovaniemi journey planner . Traveling by car from Akaslompolo to Rovaniemi takes 2.5 hours. Alternatively, you can take a bus. In March, plan for daily highs up to -1°C, and evening lows to -9°C. Wrap up your sightseeing by early afternoon on the 22nd (Fri) to allow time for travel back home.